I’ve just been to my son’s parents’ evening. It is always strange and fascinating sitting on the other side of the desk, experiencing the imperfections of another school’s appointments system, speed-dating with a handful of wonderful but weary teachers. The main value of last night’s enterprise was putting faces to names; the characters of my son’s school stories are now real. We also came away with the key messages: his teachers know him, they think he’s doing well so far, enthusiastic about the learning, and they came across as caring professionals who know what they are doing. In theory, at this stage, our parent-teacher interaction need only be light touch; our son will form his own relationships with his teachers, he’ll take responsibility for his own learning and we’ll be there in the background offering support to him and his teachers alike. Generally, this isn’t far off; our kids’ teachers are usually very positive about them and, in return, we’re full of praise for the care and attention they receive. It’s a virtuous circle; a love-in. Of course, in reality we will be watching like hawks. We are your classic North London turbo-charged über-parents who will do whatever it takes! Although I’ll absorb my son’s school experience through my professional filter, I’m going to be as demanding as hell. I see it as my right but also my duty to make sure he gets the best education the system has to offer. I am probably a bit of a nightmare for some teachers. Although I seek to be truly supportive…I generally love my kids’ teachers for their passion and knowledge and will tell them so….I’m not afraid to challenge things when I sense low standards are lurking. When, at a past parents’ evening, a teacher suggested my daughter should participate more in class, I probed. Turns out he meant she didn’t put her hand up enough!! Well, as you can imagine, he got an earful of my ‘no hands-up’ spiel; was he really expecting her to compete for air time in that ludicrous way? Similarly, the teachers who went on the defensive when I raised concerns about the absence of practical work or the lack of homework across a whole term, got a clear message. I was polite…but clear. So, that’s a flavour of how I operate as a parent. I have high expectations of my children’s teachers and fully expect them to be as demanding of me as I am of them. As a family we are doing our bit … providing the most supportive learning-focused home environment imaginable, teaching our kids about boundaries, rewarding them for being curious and conscientious and, consequently, making them ‘a pleasure to teach.’ All the bedtime reading, number games in the car, word-play in the living room and caring family discipline seem to have paid off. So, where’s the problem? The point of this post is to suggest that, too often teachers and schools aren’t open to this supportive but challenging partnership; they want the support but find it hard to accept the challenge. Generally speaking I find that most parents are very reluctant to raise concerns (it’s stressful and difficult) and when they do, a defensive reaction is too common. Parents are then labelled as pushy, demanding, unreasonable. I know a school where it is common currency to disparage parents, from the Headteacher down :’you know what our parents are like’ ie – excessively demanding, a bit of a nightmare. Well, here is the crux of this post. If we’re fretting about pushy parents we’ve lost the plot. What schools need are more ‘pushy parents’, not fewer. I’m not talking about parents who want to influence who gets picked for the school team or school play; I’m not talking about parents that are rude or aggressive; I’m not talking about the parents featured in this brilliant post by Stephen Drew (Dear Parent, what I’d really like to say is…), who are convinced that their teenage offspring never lie or misbehave; I’m talking about parents who want their children to be stretched, challenged and inspired as well as supported, nurtured, known and valued as an individual. That’s our job and if we get the occasional prompt or outright challenge to do better, we should be glad. Why? Well, consider the opposite. Read this wonderful post by Andy Day: http://meridianvale.wordpress.com/2013/09/14/the-purpose-of-education/ the powerful image of the empty chair; the absent parent of a child who needs all then help they can get. What a difference it would make if those chairs were all filled, and instead of the depressing void of parental non-engagement we had a few more parents taking an interest and, yes, being a bit more pushy. Of course, you could argue that by the time we get to secondary school, the gaps are already entrenched; we’re doing well just to stop gaps getting wider, never mind narrowing them. 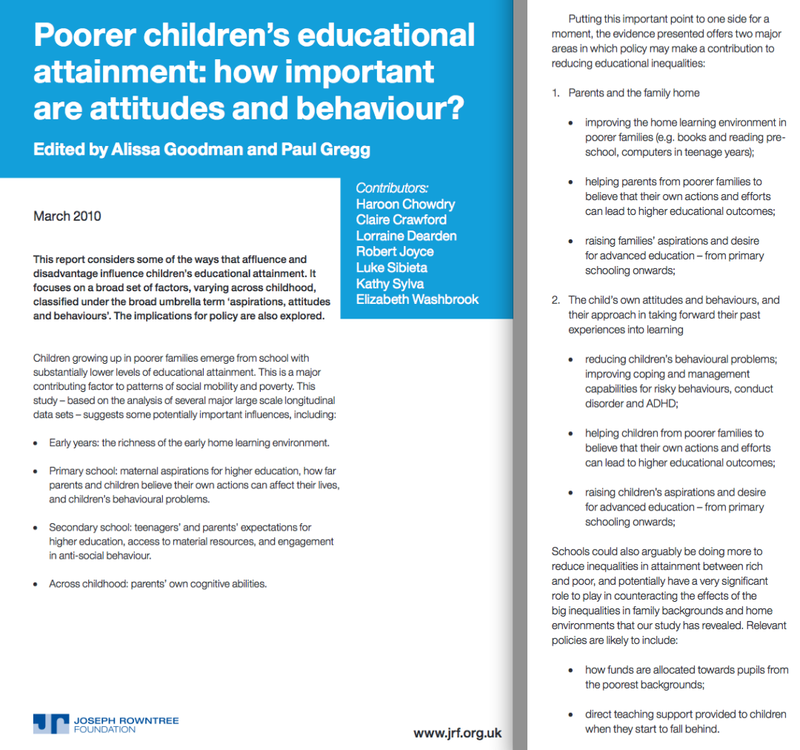 But the evidence is clear about the importance of parental attitudes and capacity to create an appropriate home learning environment. This Joseph Rowntree Foundation report sets out the issue very clearly. 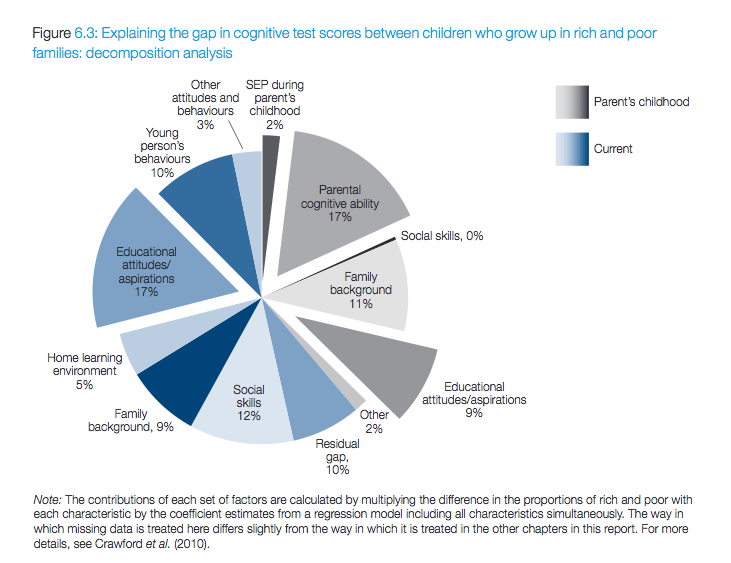 Surely this is the territory of serious transformation in educational outcomes: changing parental attitudes,raising aspirations and supporting new parents to provide a stimulating learning environment where their role in language development is understood. At primary and secondary school, I think we need to do more to address these issues head on; I’ll write about ideas for that in another post. Possibly, yes, the school could do more to reward students and could focus less on punishments. And so on… Pushy Parents: Embrace them, listen to them, work in partnership with them. They will make you a better teacher and your school a better school. And let’s focus our energies dealing with those parents that don’t know how to push at all. I can understand your point about pupils competing for air-time in a class. I prefer to ask a question to the whole class, wait a few seconds and then pick a pupil. If I do it right (not always) I can cover a lot more pupils in the class but I also expect pupils to seek ways to actively contribute, whether it is when we are sitting together or perhaps when I’ve set them some work in class and they want to stop me and ask me a question quietly on a more one-to-one basis. That teacher I think was right to seek more participation but wrong in the method they expected for that participation. I do take issue as well with your celebration of the word ‘pushy’ even if you are trying to define the right sort of ‘pushy’ approach. If over-used parents who may not have the social skills could end up using it even more as a shield whilst they continue to dominate their children and interfere with petty issues in the classroom. Why not celebrate the word ‘committed’ which I note isn’t in your post. A parent who pushes is doing it for themselves first and not their children, a parent who commits is doing it for their children first. Hi Brian, thanks for the comment. I’ve written before about why ‘hands-up’ is such a poor strategy; children shouldn’t be required to compete to answer in that way..the simple ‘think pair share’ approach is one of many ways to address this. If participation is about asking questions – ie volunteering unprompted, that’s different, but that wasn’t the issue at hand. In terms of ‘pushy’, perhaps I need to spell out that I’m not really celebrating the term at all. It’s a terrible term. But it is what many teachers use too freely to label parents who are simply offering some challenge. I know parents who are crippled with the anxiety of appearing ‘pushy’ simply because they have some perfectly legitimate concerns to raise. Of course ‘committed’ is a much better word. But do teachers naturally respond to a parent’s challenge by welcoming the input from a committed parent? Many do, but too many don’t. Obviously some parents handle this much better than others. We all take feedback better if we’re also being praised or thanked or if our hard-work and limited resources are acknowledged – but some parents find it hard enough to find their voice at all; I think we need to understand that and be a bit more thick-skinned if it comes out in an overly critical manner. Perhaps your experience is different from mine, but I would say that I’ve met more parents who are “pushy” and “demanding” without offering the support than those who do. That’s not to say there aren’t examples of that. I have had conversations with parents that involved them asking what we’re doing as a school in the same conversation as asking what they can do to support at home, and sometimes I’ve recognised that I/we could do more. But equally, I’ve dealt with parents who think it a disgrace that I’ve asked for more work from a child because they’re capable, or expected them to work at home, or questioned why I haven’t resolved some educational problem in weeks. I’ve had parents tell me that they wondering when I’m going to get round to teaching their child to tell the time, or some other such task that I would always have thought a great learning opportunity with a child at home. I’ve had the same parents demand high grades while also complaining that homework is too demanding. The reality is that parents – like any other customer – are not always right. But equally, it behoves us to remember that neither are teachers & schools. Thanks for the comment Michael. I recognise a lot of what you describe. Don’t get me wrong – I could write a very long list of all the parents I’ve dealt with over the years who have been rude, demanding, misguided, intimidating or who take no responsibility for their own children’s education. And if I wrote a guide for parents about ‘getting the most out of your child’s school’, being conspicuously supportive would be top of the list. However, despite all of that, I think there are lots of supportive parents who agonise about raising issues at schools because of the significant defensive barriers that they perceive. If we’re going to encourage disengaged parents to get involved as partners, I think we need to do better allowing those parents who are already engaged to challenge us as much as we challenge them. The example of telling the time is interesting. It strikes me that something like that should be communicated explicitly from day 1. ie telling parents, we expect you to cover this list of ideas at home – that’s the deal with coming to this school – and providing support materials etc. I’ve got another post in the pipeline about how I think we should be running a nationwide ‘parenting for learning’ campaign; we should be much more direct in telling parents what their responsibilities are in relation to education at home. High challenge both ways – that’s what we need. We push you; you push us. A parenting for learning campaign would be excellent, but it’s probably also something we as schools could be doing more on already, I agree. This is very interesting, Tom. I prefer to be ‘pushy’ in the context of pushing my offers of help onto the settings and schools that my children attend (i.e. asking to volunteer). I do think it’s also important to point out to my children that sometimes they won’t like or get on with a teacher, or the teacher might not be as brilliant as they’d like, but that they still have a duty to work hard and behave well. I think that’s an important lesson for them as well. That not everything in life can be forced into the shape that you’d most like. Agree that most parents refrain from making themselves known because they don’t want to appear pushy – they are only too aware of the reputation they may get in the school staffroom. On the other hand if we want to overcome this then the onus is on us to reach out to them and let them know that their opinions are both valid and welcome. Interesting a man as erudite as yourself would push for more homework below year 10 given its marginal effect size. I’ve written elsewhere about that. Effect size averages out lots of variables. I think homework is an important aspect of a good learning process. I disagree with your comments on air time. This came up in year 7 with my daughter, has been addressed and still needs a little attention. Why is is important? The air time issue was/is raised largely by her teachers in STEM subjects who happen to be women. As a man operating in STEM, I know the gender gap starts early and one manifestation of the gap, which has major repercussions, is that women scientists do not self-promote nearly as much as men. The argument that men need to be trained to self-promote less is probably a better one, but giving young women the confidence to put up their hand in ‘public’ and be selected I think has a major impact on that individual’s development.